Your metabolism determines how much you weigh, how energetic you feel, and the effective functioning of all your systems. Maximum Vitality™ is a unique multiple containing an incredible number of nutrients at the potency levels that truly support your healthy metabolic function. For example, it contains coenzyme Q10, which plays a crucial role in cellular energy production. CoQ10 is a vital intermediate in the electron transport chain, one of the body’s energy production cycles, which converts glucose, or blood sugar, into ATP (Adenosine Triphosphate), a molecule that is the body’s “energy currency.” Maximum Vitality™ also supplies alpha-lipoic acid and the potent R-lipoic acid form of lipoic acid, which are both referred to as the universal antioxidants and important intermediaries in the Krebs cycle, another energy production cycle. 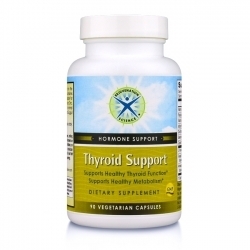 Maximum Vitality® also contains tyrosine and iodine, both precursors to thyroid hormones. These hormones regulate key metabolic functions like heart rate, digestive function, weight management and energy levels. No discussion of metabolism would be complete without mentioning the B vitamins and their coenzymated forms, such as thiamin cocarboxylase, riboflavin mononucleotide, and the methylcobalamin form of vitamin B-12. 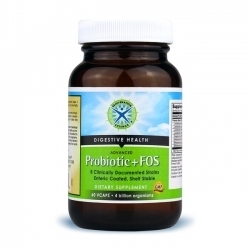 These critical vitamins and their immediately bioavailable coenzymated forms are formulated to play critical roles in thousands of enzyme reactions that promote carbohydrate metabolism, energy production, and the mental functions that invigorate and activate you as you move through your busy days. And now green tea extract with EGCG (Epigallocatechin Gallate) has been added to the formula for added metabolic support. The heart is an amazing muscular organ that beats more than 100,000 times a day, 365 days a year, promoting vitality and alertness by constantly oxygenating our tissues. Maximum Vitality® supports your cardiovascular system with antioxidant coenzyme Q10, which helps support heart muscle metabolism. Maximum Vitality® also contains the minerals potassium and magnesium, electrolytes vital for healthy heartbeat and heart function, and the herb hawthorn, a rich source of antioxidant flavonoids, which has traditionally been used as a heart tonic. Maximum Vitality® supplies vitamins B-6, B-12 and folic acid to help maintain healthy homocysteine levels and vitamin K to support healthy circulation. Unlike common multiples, it supports cholesterol wellness, circulatory health and antioxidant cardiovascular protection, with all forms of the Vitamin E -- the typical d-alpha form of vitamin E and the more potent and effective gamma-tocopherol and tocotrienols. Maximum Vitality® furnishes nutrients to build healthy bones, muscles and skin. We all know that calcium and magnesium are crucial for bone health, but many people don't know that there are a variety of nutritional cofactors that help build bone, such as vitamin D (which enhances calcium absorption and utilization), boron, manganese and copper. Maximum Vitality® supplies vitamin C and copper, necessary nutrients for collagen production (collagen is a key constituent of connective tissue in joints, skin and other areas), and the cutting-edge nutrient methylsulfonylmethane (MSM), an assimilable form of the mineral sulfur, used by the body to build and maintain connective tissues, including joint cartilage, hair, skin and nails. Additional nutraceuticals to support healthy skin include DMAE bitartrate, CoQ10, and alpha lipoic acid. Maximum Vitality™ also now includes rutin, quercetin, green tea extract and turmeric extract for your joint comfort. The hectic pace and constant demands of life can keep our pulse racing, our nerves jangling and our temples throbbing. 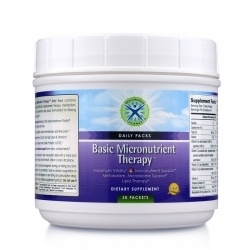 Our nervous systems are crying out, “Help!” Maximum Vitality® provides that help. Maximum Vitality® supplies the most highly bioavailable and bioactive forms of the amino acid tyrosine – the N-acetyl form and the acetyl-L form. Tyrosine is an important precursor to epinephrine and norepinephrine (collectively known as the catecholamines), which helps you respond to stress. It also contains high doses of vitamins C and B-6, required by the adrenal glands to produce the catecholamines. In addition, Maximum Vitality™ delivers the full spectrum of B vitamins, all important for healthy nervous system function. 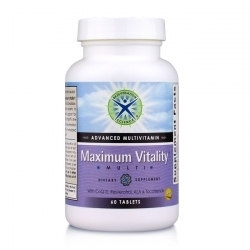 Maximum Vitality® contains special nutrients that support healthy brain function by furnishing DMAE and choline. Both are precursors to the important neurotransmitter acetylcholine and are important for memory. Included are grape seed extract, an effective antioxidant that can prevent lipid peroxidation, which is critically important for the high amounts of fatty tissue in the brain. Maximum Vitality™—good brain food. Maximum Vitality® supports your immune system, so you can feel your best through the seasons. Maximum Vitality™ contains the immunosupportive nutrient vitamin A, which fosters cell-mediated immunity and protects the epithelial linings of the respiratory and digestive tracts. Two forms of vitamin A are supplied: preformed vitamin A and its precursor, the potent antioxidant beta-carotene. Other immuno-supportive nutrients in Maximum Vitality® include vitamin B-6, vitamin C and zinc, which is fundamental for proper functioning of our T-cells, the “seek and destroy” cells of our immune system. 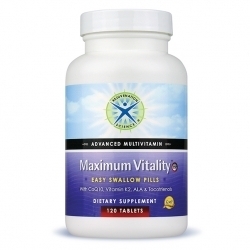 Maximum Vitality™ also includes the highly bioavailable alpha and R-isomer forms. Lipoic acid along with the B vitamins and CoQ10 promote building the energy reserves needed when the immune system needs to kick into high gear. Your liver is responsible for converting many nutrients into their metabolically active forms before your body can use them. After activation, these nutrients travel through the blood stream to target organs where they perform their metabolic functions. Not only does the liver activate nutrients, but it also plays a crucial role in a variety of other metabolic functions, from fat digestion and cholesterol production to blood sugar regulation to the processing and elimination of toxins, an important role in today’s increasingly polluted world. For all these reasons, Maximum Vitality® provides critical nutrients for the liver. Maximum Vitality® contains alpha-lipoic acid, turmeric, silymarin and N-acetyl cysteine (NAC) – all potent antioxidants that support healthy liver function. NAC and alpha-lipoic acid both help produce glutathione, one of the liver's primary detoxifying molecules. Silymarin, the active flavonoid complex of the herb milk thistle, as well as coenzyme Q10, have been shown in vitro to inhibit lipid peroxidation of cell membranes. Turmeric extract promotes bile flow and is a rich source of the antioxidant, curcumin. 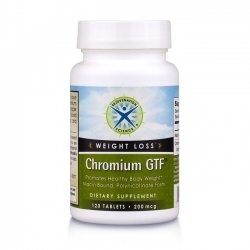 Maximum Vitality® also contains choline and inositol, vitamin- like molecules which act as lipotropics, unique substances that prevent the deposition of fat in the liver. Since the liver is naturally high in fats, Maximum Vitality™ is one of the only multiples that contains the fat-soluble form of vitamin C, ascorbyl palmitate, for antioxidant protection. Oxidative stress is the primary cause of accelerated aging. This and other forms of free radical damage are constantly threatening your body. Whether it is from pollution, ultraviolet light, food additives, or from other sources, it is more critical than ever to protect your body with antioxidants. Maximum Vitality® contains 24 of the most powerful antioxidants known to science, including eight new antioxidants based on the latest research. It contains antioxidants that are water soluble, such as Vitamin C, quercetin and rutin, and ones that are fat soluble, such as all 8 isomers of Vitamin E, alpha-lipoic acid and lycopene. There are antioxidants that are especially protective of specific body systems, such as lutein to protect the macula in your eye, lycopene to protect your prostate gland, and tocotrienols to protect your arteries. The structure and functions of your eyes are very complex. Maximum Vitality® contains nutrients to help support and maintain healthy eye tissue, which is particularly susceptible to oxidative stress from free radicals. To support your healthy macula, aqueous tissue and optical nerve signals, Maximum Vitality™ includes ingredients such as lutein, astaxanthin, beta carotene, bilberry, zinc, lipoic acid and quercetin. 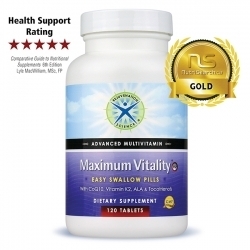 Maximum Vitality® provides robust nutritional support to help you maintain long-term health. Combined with a relatively healthy diet, exercise, and regular medical check-ups, Maximum Vitality® provides the optimum level of nutrients recommended in the Comparative Guide to Nutritional Supplements. Guyton, A. 1991. Textbook of Medical Physiology, Eighth Ed. W.B. Saunders Co., Philadelphia, PA.
Halliwell, B. and Gutteridge, J. 1995. Free Radicals in Biology and Medicine. Clarendon Press, Oxford. Linder, M. 1991. Nutritional Biochemistry and Metabolism, Second Ed. Appleton and Lange, Norwalk, CT.
Mathews, C. and van Holde, K.E. 1990. Biochemistry. The Benjamin Cummings Publishing Co., Inc.
Shils, M. and Young, V. 1980. 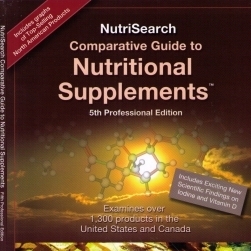 Modern Nutrition in Health and Disease, Sixth Ed. Lea & Febiger, Philadelphia, PA. Maximum Vitality® was designed based on the top 1 percent of multivitamins using the following criteria established in the Comparative Guide to Nutritional Supplements by Lyle MacWilliam. Looks to see if the product contains all the Blended Standard nutrients. Looks to see how much of each nutrient the product contains compared to the Blended Standard amounts. Examines the molecules that minerals are bound with to help them cross into the bloodstream. Amino acid chelates and organic acid complexes (such as citrates and gluconates) mimic the natural mineral chelates that form during the digestive process. Chelated minerals also appear not to block other minerals from being absorbed, unlike many of the less expensive mineral salts (carbonates, sulphates, and chlorides). While d-alpha tocopherol is the most common form of vitamin E, gamma tocopherol and other forms offer additional protection from inflammation, cancer, and other processes that can damage cells. High-dose supplementation with alpha tocopherol alone can reduce the level of gamma tocopherol in body tissues. Recent scientific research confirms the vital roles that vitamin D and iodine play in maintaining our long-term health. This new criterion examines the many nutrients, including vitamin D and iodine, which help to ward off many of the most common degenerative diseases that shorten our lives. Examines the nutrients that help to prevent or repair cellular damage caused by oxidation, including vitamin C, vitamin E, vitamin A, beta-carotene, alpha-lipoic acid, lycopene, coenzyme Q10, iodine, and selenium. Examines the nutrients that assist in bone remodeling, vital to ward off osteoporosis and other diseases that weaken the skeletal framework. These nutrients include vitamin D, vitamin K, vitamin C, vitamin B6, vitamin B12, folic acid, boron, calcium, magnesium, silicon, and zinc. Examines nutrients that help protect the heart and cardiovascular system including vitamin D, vitamin E, beta-carotene, coenzyme Q10, calcium, iodine, magnesium, l-carnitine or acetyl-l-carnitine, procyanidolic oligomers (PCOs), phenolic compounds, and lycopene. Examines those nutrients (including vitamin C, cysteine and n-acetyl-cysteine, iodine, selenium, vitamin B2, and vitamin B3) that enhance liver function and optimize levels of glutathione, which help cells fight off toxic challenges. Examines those nutrients that help the body handle its daily sugar load, keeping systems responsive to insulin and restoring lost insulin sensitivity. These nutrients include vitamin B3, vitamin B6, vitamin B12, vitamin C, vitamin D, vitamin E, biotin, coenzyme Q10, chromium, iodine, magnesium, manganese and zinc. Good eyesight and prevention of cataracts and macular degeneration require adequate levels of several nutrients, including vitamin C, vitamin E, vitamin A (including beta-carotene), and the carotenoids, lutein and zeaxanthin. Looks at those nutrients, including vitamin B2, vitamin B6, vitamin B12, folic acid, and trimethylglycine, required for the body to produce methyl donor molecules. Methyl donors help reduce homocysteine levels in the blood, protecting the arteries and nerve fibers. Examines those nutrients, including choline, lecithin, and inositol, that help remove toxins, including heavy metals like lead. The liver and the brain are two primary targets for the accumulation of fat-soluble toxins. Examines the nutrients responsible for reducing inflammation at the cellular level, such as omega-3 oils -- including those found in fish oil (eicosapentaenoic and docosahexaenoic acids or EPA and DHA) -- linoleic acid, gamma-tocopherol, alpha-lipoic acid, vitamin C, vitamin D, iodine, flavanoids, procyanidolic oligomers (PCOs), and the phenolic compounds. Chronic inflammation can lead to serious degenerative disease, including heart disease, cancers and arthritis. Examines those nutrients (l-carnosine, alpha-tocopherol, gamma-tocopherol, vitamin C, and alpha-lipoic acid) that help slow the progress of many degenerative diseases, including Parkinson's disease, Alzheimer's disease, and cancer. Examines a specific group of phenolic compounds (polyphenolic acids and their derivatives), known to be exceptionally potent defenders against free radicals. Phenols derived from olives, green tea, and curcumin are also known to improve major risk factors for cardiovascular disease, including lowering the impact of inflammation. Examines those nutrients that can build up in the body, possibly leading to toxic levels with long-term intake. This includes vitamin A and iron. Accidental overdose of iron-containing supplements is, in fact, a leading cause of fatal poisoning in children. Vitamin A is available, safely, as beta-carotene, while adequate iron is easily obtainable for most people from foods.